How well do you know your neighbors? If you’re like most people these days, probably not very well. A recent study from Pew Research indicates that more than half of all Americans today know only some of their neighbors by name — and 28 percent say they know none of their neighbors’ names. As great as the virtual world can be, it’s still important to know the people who surround you in the physical world — whether you need to find a good babysitter, borrow a cup of sugar, or plan what to do in the event of a major natural disaster. That’s where Menlo Park, Calif.-based startup Nextdoor comes in. Founded by tech industry veteran Nirav Tolia (of Epinions and Shopping.com fame), Nextdoor lets neighbors within certain regions create private websites where they can exchange local information and events while getting to know each other better. 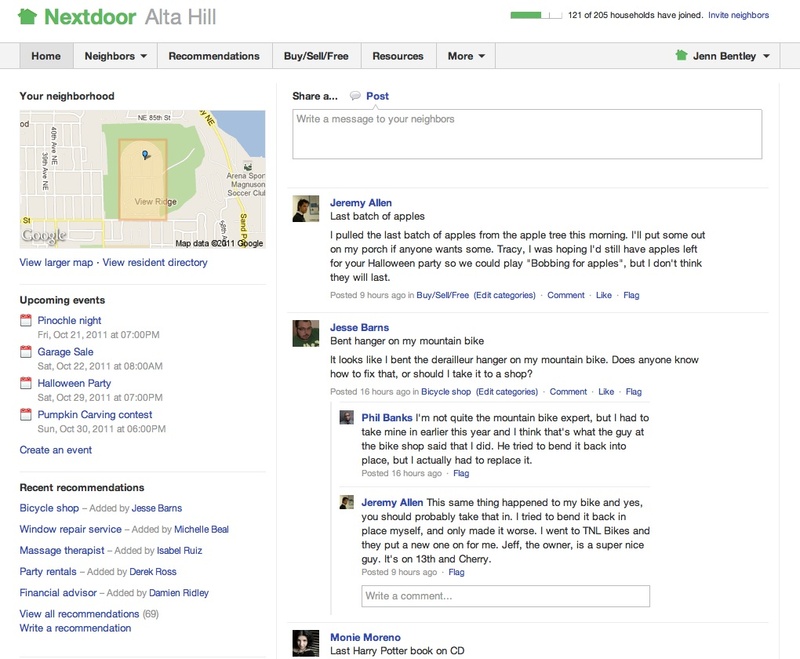 Nextdoor was founded in the fall of 2010 and is officially launching to the public Wednesday. To be a member of Nextdoor, you must register with your real name and real physical address. 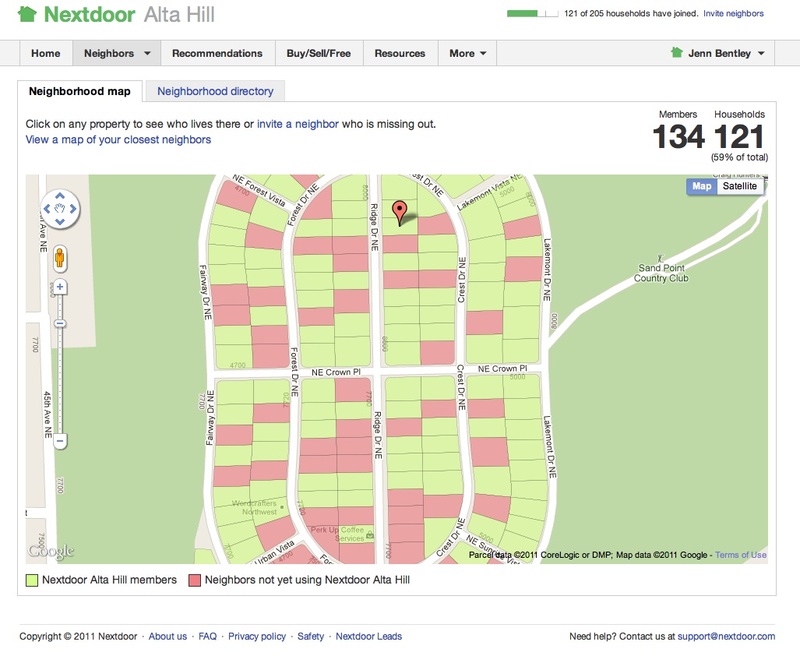 Nextdoor verifies members addresses in one of four ways: Sending a postcard to the address with a unique code, making a phone call to a listed number at that address, linking the person to a billing address from a credit card they provide, or by providing an invitation from a previously verified neighbor. “We were inspired by the early days of Facebook; when they launched, they required university-specific email addresses to allow people to access university-specific networks within Facebook. That creates a little friction up front but ultimately it allows people to feel more comfortable,” Tolia said. Each Nextdoor network’s size is established by the first person to add the region to the site — Nextdoor provides a drawing tool that allows users to define the boundaries of their neighborhoods on top of a Google map. Boundaries can be changed later as the group evolves. The typical Nextdoor network would comprise between 50 to 2,000 households, depending on the geographic region and its density. Why the need for Nextdoor, in a world where it seems like so many different social networks already exist? The company says it’s because neighbors fill a distinct role in our lives: We don’t necessarily want to be Facebook friends with them or add them to a Google+ Circle; we probably don’t know their email addresses, or even their names, to initiate such a relationship. That’s why in addition to letting people join the site via email, Nextdoor lets users print semi-custom flyers inviting neighbors to join the site, and it will also send personalized postcards to their neighbors for them. But will it really take off? Nextdoor is backed with an undisclosed amount of funding from Benchmark Capital and Shasta Ventures; its board of directors includes Rich Barton, the chairman and co-founder of real estate website Zillow(s Z). The company currently has 22 employees. Nextdoor currently does not make money; it plans to eventually generate revenue by allowing local merchants to advertise their goods and services on the site. When I was given a demo of Nextdoor, I immediately recognized its potential value — it’s that very rare website that I could envision my extended family in the Midwest using, just as well as I could imagine using it myself. It’s a mix of a crazy idea (another social network?) with one of the oldest, most practical ideas around (love thy neighbor, of course.) And like any social network, it’s only as good as the people who are on it. Only time can tell if Nextdoor will take off, but it certainly seems worth a try — and what better time than now. How do you verify your address? I was asked to join and I agreed but the directions on the postcard that was sent to me that asked for address verification are a nightmare. There is no direct link to the address verification and I have spent over a half hour trying several links. Giving up as i have better things to do. Great idea in theory, but how are they going to replace Facebook? Lots of privacy, security, and authentication issues. Plus what is the revenue model? Ad sales? Nirav did well w/ Epinions, but only after he “merged” it with Shopping.com (prolly b/c he was running out of cash), prior to the sale to Ebay. Next came Fanbase – has anyone heard of that one? Yeah, me neither. Hello, I’m Nirav Tolia, the CEO of Nextdoor. Thank you for all of the comments – we rely on the feedback of our users to make the service better for everyone. 1. Each Nextdoor neighborhood website is completely private and available only to neighbors who have verified their addresses. The websites cannot be accessed externally, or by search engines. Our intention is to create a trusted online environment where neighbors feel comfortable coming together and sharing information. 2. Each member of a Nextdoor website is required to use their real name (there are no anonymous members) and street name where they live. Exact house number, email address, and any other personal information is optional. Our intention is to establish true identity for neighbors while protecting any sensitive information they do not wish to share. 3. According to a November 2009 Pew Internet report entitled “Social Isolation and New Technology”, neighbors who communicate online are actually more likely to support their neighbors and in general have higher levels of in-person engagement with them. Our intention with Nextdoor is to strengthen real-world neighbor-to-neighbor communication, not to replace it. We know that in-person interaction is ultimately the most powerful medium and online tools like Nextdoor should help encourage more of it. Thanks again for your comments and we hope you will give Nextdoor a try. This doesn’t seem like a replacement for knowing thy neighbor. It is kind of like a local neighborhood newspaper. Would be cool if you could arrange by topic/time and page through to catch up EOD or week. This could be a more efficient way for neighbors to trade relevant neighborly information. I found out with NeighborPal.com, there is a need in the market. Site’s like NextDoor and NeighborPal have to apply the correct mix of online tools to meet the need. Great article. It’s interesting to consider whether Nextdoor will primarily take off in urban areas, where there’s a higher density and greater anonymity (indicating a potentially greater net return for users), or in rural areas, where neighbors are more likely to known, but correspondingly there’s a greater interest in being neighborly. Good point, Kevin. In my one-on-one demo with the company I was able to look at versions of the site in a few different beta test areas, and I did see a contrast between rural places and denser regions. But I mostly noticed a difference in the users’ topics and tone, not how frequently they used the site. It’ll certainly be good to check back in with Nextdoor a few months after this public launch to see where it’s actually taken off. We have been testing NextDoor for about a month as a potential replacement for the city-provided ListServ. We have about 400 homes plus businesses in our central Seattle neighborhood, so it’s not like you are going to know everyoneâ€” but based on the feedback and watching how neighbors are interacting on it, I think the concept has real potential. I’d also have to give a shout out to their great customer support as they are trying to build tools for the many variations of how neighborhoods actually work. Thanks for weighing in, Knox — cool to hear some firsthand insight. Neighborhood Social Network, or completion of the Total Information Awareness program for domestic surveillance? Now Big Brother can get your neighbor to peek out their window to see what you’re up to. Dont get me wrong, I like the idea, it could be a great way to organize and inform locally. I just wonder how this tool could be used by those with less than honorable intentions. Someone could actually go shopping for their next victim. This is an excellent point. Initially I thought it was OK since everyone is verified to be “in the neighborhood.” But so what? How many times have you heard, “He/She seemed like such normal guy/gal.” from the neighbors of convicted criminals.Do you really want to be networked with someone you don’t know based solely on geography? Even more reason to walk across the street and actually meet your neighbors. I predict this site going the way of Pets.com. Amen DEC, this is a half brained idea at best! I mean hell, you could always just go about your business and not get to know your neighbors, … kinda like we do now! That’s the exact situation they are trying to remedy…people not knowing their neighbors. Our neighbors could be one of our most easily accessible resources and yet so much of the population goes without even introducing themselves to their neighbors. A social network promoting relationships amongst neighbors will lead to more face-to-face interaction in a neighborhood GUARANTEED. Funny thing about Americans, we all say we want to talk to our neighbors but when we see them it seems to take all our bravery just to smile and say hello. That’s been my experience on the East and West coasts. So I can see interest from timid middle-class folks that want to get to know they’re neighbors but, raised on the Internet, are scared of people IRL. Besides, locally-based sites are one of the biggest web trends of the moment. I’m not saying they’ll succeed, but I see potential based on these two facts. Anyone know how this is different / better than EveryBlock.com?